LAS VEGAS, Nev. – It’s been said awards are for losers, but any product winning a “Best of Show” at ICAST is up for a windfall. ICAST, the International Convention of Allied Sportfishing Trades, brings together more than 9,000 industry representatives from the global sportfishing industry to see the latest innovations in tackle, gear, accessories and apparel. Media and buyers scrutinized the offerings in the single-largest reason many attend, the New Product Showcase, and voted on products in a variety of categories. Products that win are announced Wednesday, giving buyers plenty of time to make orders. The ICAST 2013 “Best of Show” awards were presented on during the Chairman’s Industry Awards Reception, sponsored by Rapala, at the Las Vegas Convention Center. As a special treat, National Baseball Hall of Fame member Johnny Bench, this year's State of the Industry Breakfast keynote speaker, presented the awards. ICAST, the world’s largest sportfishing trade show, runs July 9-12 at the Las Vegas Convention Center. It is produced by the American Sportfishing Association (ASA), the industry’s trade association. The show is its 56th year and is the catalyst that drives the global recreational fishing industry year-round. 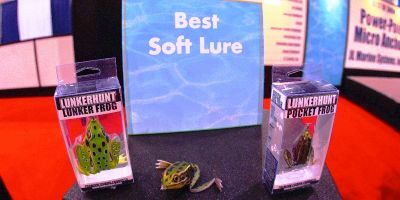 Sponsored by Fishing Tackle Retailer, nearly 200 companies entered more than 700 tackle products, accessories and apparel into the New Product Showcase. Making up a special section of ICAST’s 400,000-square-foot show floor, the New Product Showcase provides special visibility for the industry’s latest innovations in gear, apparel and accessories. ICAST 2014 will be held at the Orange County Convention Center, Orlando, Fla., July 15-18, 2014. For complete ICAST information, visit ICASTfishing.org.